A good understanding of the newest global developments can support the identification and harnessing of leverage points for systemic and effective change. The trend compilation report ‘Impactful trends in Europe trends in 2040’ supports this understanding. 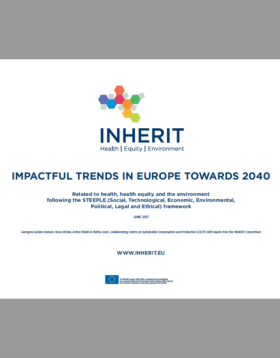 Based on extensive desk research and the STEEPLE Horizon Scanning approach the report contains a compilation of more than 40 trends that provide an overview of Europe’s trajectory by 2040 in the context of health, environment and health equity.